If you are looking to introduce Tuscan design into your home décor, it is first important to understand the aspects of Mediterranean decorating. The article “Tuscan Interior Design Ideas”, by Dana George in the SF Gate, goes over the key elements of Mediterranean décor and how to bring it into your home. 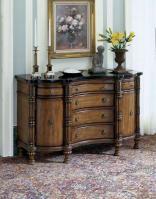 This article provides a good overview of Tuscan decorating. In particular, it discusses the flooring, furniture, wall colors and accessories that will create the feeling of warmth prominent in Tuscan decorating.